The Grand Scholar Sayyed Ali El-Amine emphasized on the fact that some people desperately tried in a dark period of history to take considerable advantage of the martyrdom of Imam Hussein (AS). This was fully intended to favour their political projects, and personal authoritative ambitions. 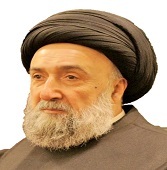 In an interview with 'Al-Watan' Sayed El- Amine stated that; these people once attracted other individuals with the slogan of "taking revenge for Imam Hussein" and the reason behind this was the fact that the tragedy of Imam Hussein was one that people could feel sympathy towards its tyrannised effects alongside its religious importance to Muslims.Furthermore Sayyed El -Amine certainly indicates that when we don’t insult others through our practices and traditions, then we are truly the ones practicing the principles of reform for which Imam Hussein uprose. Sayyed El-Amine also called for re-consideration when reading the true aspects and lessons of the majjalis practices by promoting this event with tools that correspond to the goals and objectives of this holy event thus presenting Ashurra as a school in which we learn and derive from it how to face oppression and corruption. In all due fairness, El-Amine added that "this is the main objective that the Sha'ariah law wants from society which is rightfully based on unity and cooperation among its members. -How would do you examine the reality of what happened at the battle of 'Karbala' in which shedding of holy blood took place? 'Ashurra' in our Islamic history was a painful event that exceeded tragic chapters and criminal content. This event with no doubt clearly showed the deep audacity in shedding blood which God Almighty has forbidden to, and this is strongly testified in both the holy Quran and the Sunnah of the holy prophet (p.b.u.h) in which they are surely the main source of belief and Sharriah law of this heavenly message (Islam) that all Muslims believed in. Additionally, this audacity was reached to include highly religious figures like Imam Hussein (a.s) the grandson of the Messenger of Allah Mohammad (p.b.u.h), his progeny and companions. And they had heard the well known tradition of the Prophet about his grandsons: "Al-Hassan and Al-Hussein are the leaders of the youth of paradise". -What is the reason behind these solace rituals being held this time every year? It is for what 'Karbala' was of a great tragedy for all Muslims in that it deeply traumatized them. Muslims recall the memory of this tragedy every year in order to derive from it inspiring lessons. Among the many reasons for the remembrance of this tragedy was the brutality of the event and its outraging effects which we repudiate and deny so that such an event is not repeated or seen again happening among Muslims. For if Imam Hussein's blood was to be shed without any rejection then the value of any Muslim blood will no longer be of any importance, and thus this event would be politically exploited. -However, there are those who take advantage of the martyrdom of Imam Hussein in favour of their political projects and authoritative ambitions? True, as I said before that some people desperately tried in a dark period of history to take considerable advantage of the martyrdom of Imam Hussein (AS). This fully intended to favour their political projects, and personal authoritative ambitions. These people once attracted other individuals with the emblem of "taking revenge for Imam Hussein" and the reason behind this was the fact that the tragedy of Imam Hussein was one that people could feel sympathy towards its tyrannised effects alongside its religious importance to Muslims. Yet, these people use the saying of Imam Hussein as evident that: "for a martyr a revenge with God" ? My dear brother, Imam Sadiq (as) was aware of the negative consequences and outcomes of this slogan that at some stage would ignite seditions and mischief in the Muslim community. Imam Al-Saidq stood up and faced this situation that was hiding behind it the love of power and authority, he strongly told them that Imam Hussein is not a revenge for a group of people nor for a tribe neither a clan but he is God's revenge. When the martyr is killed for the sake of God then God will take revenge from the unjust through his laws and provisions that truly destroy the thrones of tyrants. -So what does it mean to take revenge for Imam Hussein at this time? Imam Hussein is not a revenge for the tribe of 'Hashem' nor a revenge for a certain sect neither is he a retaliation for a school of thought. Having said that, those who committed such a heinous tragedy are now in the court of God, therefore Imam Hussein became a martyr and a martyr is certainly God's revenge and hence God is the best ruler. For this reason, whenever Imam Sadiq used to address the tomb (or grave) of his grandfather Imam Hussein he used to always say: "
What kind of lessons are derived from 'Ashura' through which the Muslim communities can benefit from in our present day? 'Ashura' is a discipline from which we learn lessons of patience, sacrifice and redemption in addition to the refusal of oppression and injustice. 'Ashura' is a model of the truthful word that opposes corruption in the land and resists the oppression of people. It is also a strong witness on the blatant abuse of the dictators that often respond to the voices of reform through the use of swords and beheading. The reasons and circumstances that surrounded Imam Hussein and the forces driving his uprising with his knowledge of the consequences are privatised to Imam Hussein's personal character, in other words it is part of Imam Hussein's duty. This is referred to as "Ka'ady'a fe waq'aa" in the science of jurisprudence meaning "an issue in an event". -This means that, 'Karbala' was not repeated in any time after the tragedy? Yes, that's what we understand from the Imams of Ahulubayt after the martyrdom of Imam Hussein (as), the movement of Imam Hussein was not seen by the Imams after him as a "general principle" to uprise against the ruler.For this reason, 'Karbala' was not repeated in the time of the Imams after Imam Hussein even though oppression still took place at that time (ie. during the time of the Imams after Imam Hussein) with the same degree of brutality if not severer. Why don’t we justify the uprisings of the oppressed people through the application of the event of 'Karbala'? I say: 'Karbala' in its brutal effects was not an act by Imam Hussein nor was it a result of his proceedings for us to apply it to our lives and to our societies, rather it was certainly the doings of evil through an evil ruler. -So, you call upon the change in the reality of such oppression and injustice by promoting it through gentle persuasion? We should carefully view the goals of Imam Hussein in seeking to achieve reform in our society and nation as Imam Hussein did when he called upon reform in the nation of his grandfather the Prophet (sw) through the command to promote virtue and prevent vice. And thus we shall imitate what was narrated by Imam Ali (as): " Look at the progeny of the Prophet and be attached to their characteristic trait and follow their footsteps, as they shall not take you back into misguidance neither will they return you back into destruction. If they uprise you uprise, and if they settle you settle, and do not overtake them as you will be misguided and do not postpone following them as you will be destructed." -Do some of the rituals in 'Ashura' have any legitimacy in the Shari'ah? No! That’s why many of the practices that take place on the occasion of Ashura have become over time part of the customs and traditions that don’t have any origin in Islam. In addition, Ahlulbayt (as) themselves did not even practice such traditions in their lives. Many of the Imam Hussein biography narrators narrate Imam Hussein's advise before his death to his sister the holy lady Zeinab as to not beat herself or gripe her hair or do any other act of mourning that the Sharriah condemned. Then, what is the reason that drives its replication (ie. rituals) in events of solace? These traditions were enhanced over many centuries and were determined through emotional approaches! The scholars in a general sense did not expose themselves to educate these rituals and were not willing to teach people the right principles and values to be practiced in such events. This inattention by the scholars gave people the feeling that such traditions are recommended religiously. Some even think that these rituals have reached the degree of legitimate religious duties that must be practiced!!! -Are there any religious scholars that denied such illegitimate acts? There are many religious scholars that don’t practice such acts and don’t even agree with its existence. Others forbiddingly say that it is not permissible to participate in such actions such as the head and body bleedings. This view is strongly supported by the late Grand Scholar Sheikh Mohammad Jawad Mognya: “The customs and traditions adopted by most of the floaters are certainly not acceptable to become a main source of belief and doctrine because the majority of such traditions are not acknowledged by the religion to which they belong, even if some scholars which are seen to represent religion supported such acts. This includes different practices carried out by ordinary Shi'ites in Iraq, Lebanon and Iran such as wearing the coffins and beating their heads with swords on the tenth day of Muharam. This habit has become a shameful innovation in the religion and school of thought. In addition; these traditions have been established by ignorant people without being authorized by a scholar or an authority. Moreover, it is also common to depict such innovations in other religions and beliefs, in which there are a number of traditions that are instantly not endorsed by the doctrine that they belong to in the first place. This wave of traditions is undoubtedly followed by total silence by some people who fear insult and harm to their life, these people did not dare to illegitimate these acts in a sense. Contrary, only a small number of scholars had the will to stand clear against such practices. Among these scholars is the Grand Scholar Sayed Mohsen Al-Amine who composed a special book in prohibiting these practices and thus called his book: "Al Tanzi'h Le'ama'l Alshabih." -Consequently, there is an urgent need to reorganize these rituals? We call for the necessity to re-examine the reorganization of these rituals particularly in presenting and promoting its understanding and readings through devices that are consistent with the goals and objectives of this anniversary. As a result, 'Ashura' becomes a leading school from which we derive lessons in facing injustice and corruption with contemporary elements. Moreover, achieving internal reform in the course of calling for the good and forbidding the evil is the main objective that the Sharriah law wants from society which is rightfully based on unity and cooperation among its members. -How do these rituals become a lighthouse in calling for good and forbidding evil? When we compete for the interests of people and the nation through which we seek to enhance brotherhood among all citizens, this will definitely place us amongst those commanding good and forbidding evil. -What values should be advocated by these rituals in order for it to be on the path of Imam Hussein? When we don’t insult others through our traditions and practices, then we shall be among those practicing the values and principles that Imam Hussein uprose for. This in turn makes us also consistent with what Imam Al-Baqir described his true Shia: "They are a blessing for him who is their neighbour. And they are peace for him who associates with them. When they become angry, they do not do wrong." How can Muslims benefit from the anniversary of the martyrdom of Imam Hussein? When we maintain regularity matters and appeal to institutions of governing and maintaining order then we would certainly be from those following the footsteps of Imam Hussein. In addition, when we also call for better wages and achieve social justice and equality between the ruler and the people in obtaining health and education insurance then we'll be among those seeking the path of Imam Hussein. May Allah (sw) place us all among those who listen to what is said, then, follow the best of it. So peace be upon Imam Hussein, on the day he was born, and on the day he was martyred and on the day he shall be raised up to life, and our final prayer; all praise and thanks be to Allah, the Lord of existence.